I think you know how much I enjoy making these little DIY Ornaments. I made several that traveled out to California for CHA and then back home to Michigan. I picked them up last week so was finally able to take some photos of them so I can share them with you all. You’ll find a tutorial over on the G&P Blog today and I’m gonna give you a quick run-down here as well. On the G&P Blog I show you how I made one using clip art inside and this one here shows how I used some of my vintage button stash. They’re both very different. 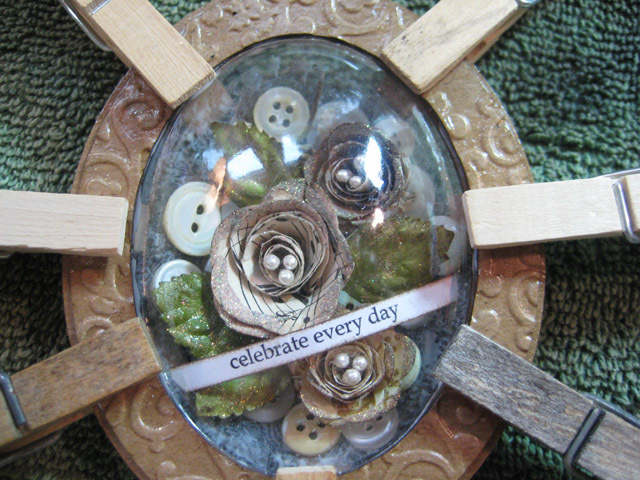 For this one, titled ‘Celebrate every day,’ I wanted to leave the bookboard rings their natural color. I did, however, place them in an embossing folder and run them through my Vagabond. I did this for both outer rings. It’s not necessary for the inner ring because only the very edge shows. I then squeezed on a good amount of Glastique Gloss on both outer rings and both sides of the inner ring and spread it around to give the bookboard rings some shine. It also acts as a sealant and really makes the embossing noticeable. DIY Ornament: outer rings embossed and treated with Glastique Gloss. I cut and rolled several paper flowers with the Sizzix Flowers, 3D die. I had some leaves and a vine leftover from some project so decided to use them all together. I used a small paint brush to apply Glastique to the leaves and flower edges an sprinkled them all with a light dusting of Fawn Microfine Transparent glitter. I set those aside while I figured out what else was going in this globe. I opted to finger paint some Rose Pink 3D Enamel Gel onto the inside of the back globe. This provides a bit of dimension and texture and is still transparent while making the finished piece look good from the back. When that dried I adhered vintage buttons in a single layer to fill the back globe. Now I could start assembly. I laid the vine, leaves and flowers in until I got an arrangement that appealed to me then I glued them all in place, added the computer printed phrase and let it sit a while to set up. 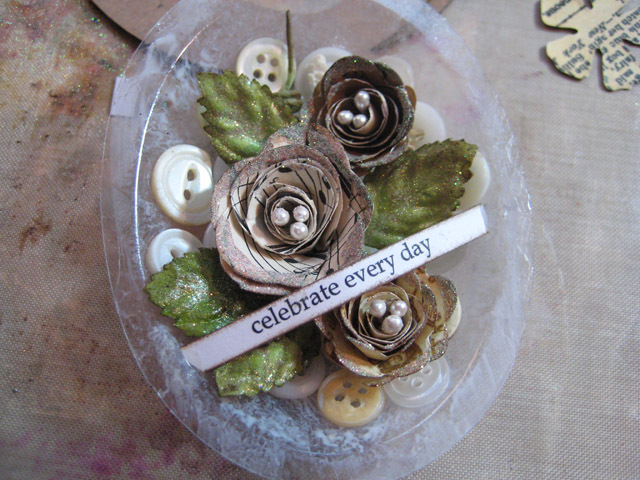 DIY Ornament: back globe with vintage buttons and 3D paper flowers. When it was pretty stable I added a thin line of Glastique to the unfinished side of the bottom ring and set the globe into it, clipping it together with clothespins while the glue sets up. When it’s pretty much set, run a thin line of Glastique around the lip of the globe and lay the inner ring on it; clip to set up. DIY Ornament: inner ring glued to top portion of bottom globe. The Glastique dries clear so no need to fret over a little bit oozing out. Now glue the top globe to the inner ring then glue the top embossed ring over that and clip till the glue sets. I like to leave these for a couple hours or overnight just so I’m sure all my glue is perfectly dry before messing with it. DIY Ornament with all layers together; clipped to hold tightly until glue is set. DIY Ornament with Glastique finish. This one went together quite quickly and I added a Tim Holtz Swivel Clasp to the top for hanging. There’s another ornament over on the G&P Blog today from me. If you’d like to try this on your own you can order your DIY Ornaments by clicking the link below. I’ll also have a class or two coming up at Scrapbook Peddler with the DIY Ornaments so watch for that date to be added to the calendar soon. I’ll be at the Scrapbook Peddler next weekend for a Piccolo Card Class. Oh, how lovely! The natural colors you chose give this the feel of a terrarium, and that’s a very good thing! Wow-this tutorial is just what I needed.Thank you so much!